And all the endless ways you'll notice them in your dog. Show us the way you’ve noticed the 5 Signs of Wellness in your dog by tagging your photos on Instagram or Twitter with #5signsofWellness. See the 5 Signs of Wellness in your pet. As always, Wellness® Complete Health guarantees your complete satisfaction. Click on each to see what they mean for your dog. Give your dog a soft coat that invites family snuggles. A clean soft, shiny coat says, "snuggle up and give me some love!" Wellness Complete Health recipes all include essential vitamins and minerals, as well as guaranteed levels of Omega-3 and Omega-6 essential fatty acids from ingredients like salmon and flaxseed. Upset tummies slow him down and can keep your dog from added tail-wagging, run-around time. Wellness Complete Health recipes provide probiotics, prebiotics, chicory root extract and healthy fiber which enhance digestion. Give him bigger smiles, brighter eyes, and happier barks. Nothing beats clear, bright eyes looking up at you saying, "I love you" with a big smile. Eyes should be clear with no excess tearing. Teeth and gums should be clean with no inflammation. Chasing balls, going on long walks, and of course, an over-the-top greeting when you walk in the front door… there are many ways to see the energy your dog should have. 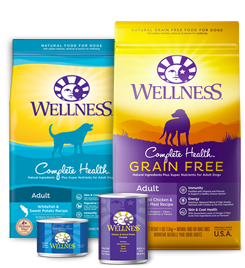 Nutritious, balanced blends of high quality proteins, select fats and carbohydrates like those found in Wellness Complete Health will provide the energy a pet needs. A strong immune system means a more playful, energetic dog. Wellness Complete Health recipes are fortified with ingredients such as zinc, selenium and vitamin E to help maintain optimum health and disease resistance. Small dogs, big dogs, puppies and senior dogs – find the perfect Wellness Complete Health recipe for your best friend. I'd like to receive communications from WellPet.